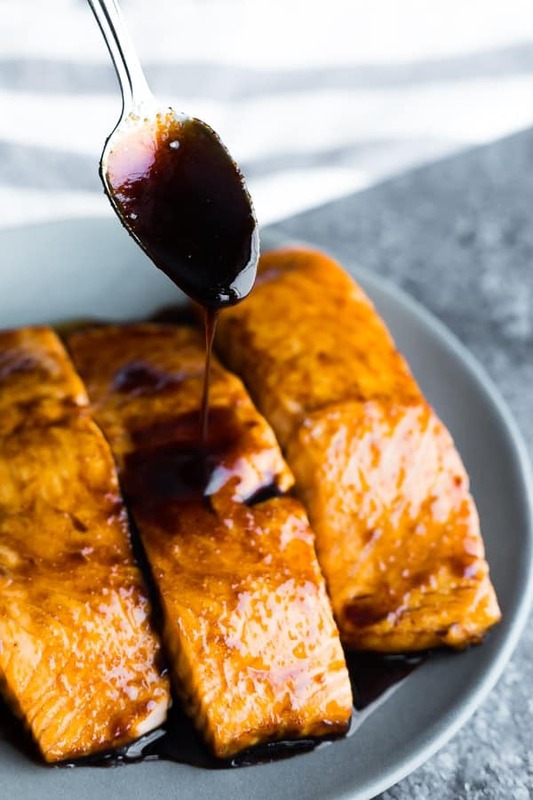 This simple balsamic salmon marinade has just 3 ingredients, and gets dinner on your table in no time. Plus my new favorite method for perfect baked salmon! 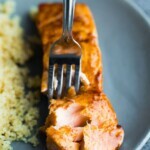 We try to eat salmon once a week, and it’s one of my favorite things to cook because you can thaw it out quickly, and it cooks through so fast as well! Not only that but it’s one of the few proteins my kids will gobble down without complaining. 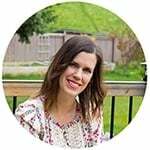 Today I’m sharing my new favorite baked salmon recipe along with a delicious balsamic salmon marinade! 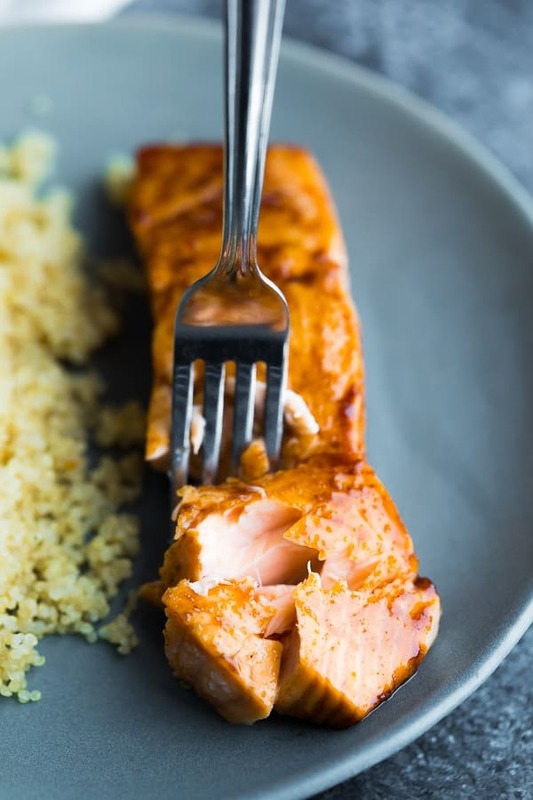 Not only is it delicious baked up as is, but if you turn the leftover marinade into a glaze, you have a delicious tangy sauce to drizzle over your salmon, rice and veggies. 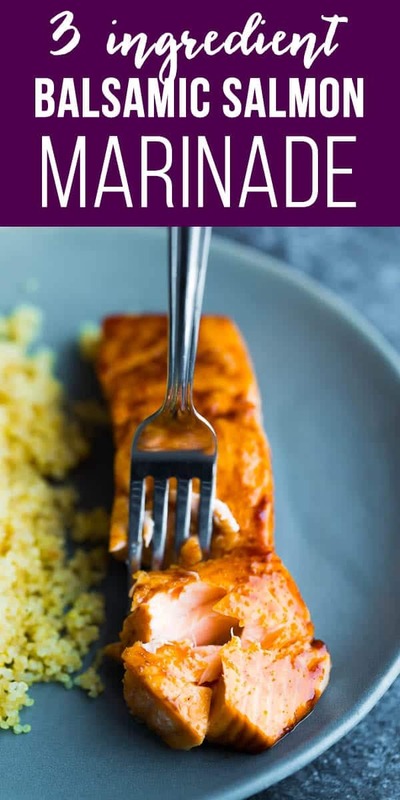 you can turn the marinade into a sauce to drizzle over the salmon, rice and veggies! Shake these three ingredients together and get your salmon in the marinade while you prepare side dishes for your dinner. How long to bake salmon for? This is going to depend on your oven temperature and this size of your salmon fillets. For this recipe, 10 minutes was perfect for my 5-6 oz fillets. Why do you pre-heat the pan in the oven? I’ve used Cook’s Illustrate’s brilliant method: pre-heat the oven to 500°F with your baking dish in the oven (note- you can’t use a glass baking pan for this recipe as it runs the risk of shattering). Place the marinated salmon on the pre-heated pan and place in the oven. Immediately reduce to 275°F. This sears the outside of the fish, which helps lock moisture in. It’s my new favorite way to bake salmon! 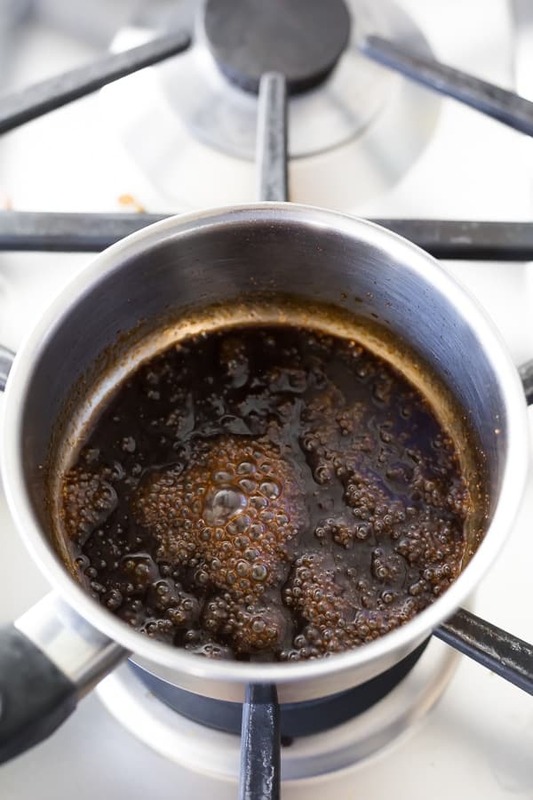 Why do you boil the salmon marinade recipe? While the fish cooks, transfer the marinade to a pot and simmer until it is thick and coats a spoon. Then you have yourself a tasty (and really tangy) balsamic reduction you can spoon over your salmon, veggies and rice. What goes well with this balsamic baked salmon recipe? I have tons of ideas for you! how about some Brown Butter Broccolini? 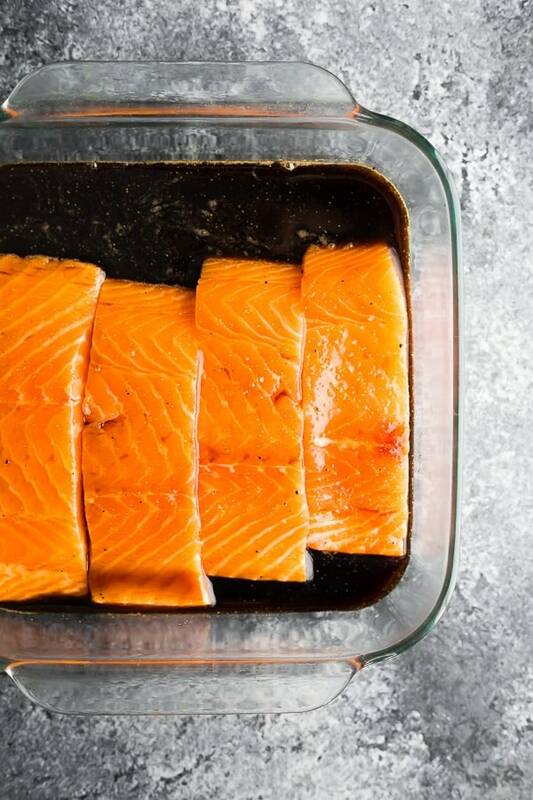 Place salmon in a 9x9 inch baking dish. 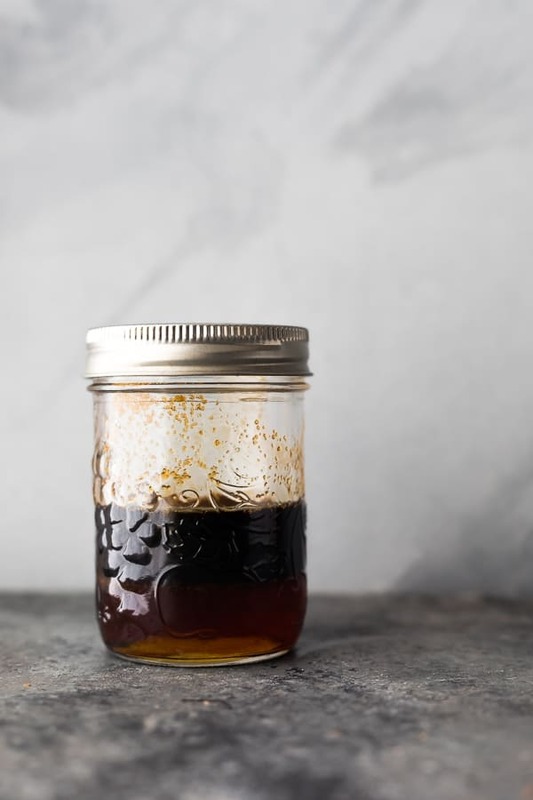 Shake together the balsamic vinegar, maple syrup and garlic powder. Pour over the salmon and turn to coat. Marinate for 30 minutes. Carefully remove the pan from the oven. Shake excess marinade from salmon and place on the baking sheet. Put salmon in the oven and immediately reduce the temperature to 275°F. Cook for 10 minutes, or until it flakes with a fork. While salmon bakes, transfer the leftover marinade to a small pot. Simmer for 10 minutes, or until thickened enough to coat a spoon. Drizzle sauce over salmon, rice or veggies.